Put your diet on hold when visiting Southeast Asia. In these parts, locals ask "have you eaten?" in place of "how are you? "; awesome dining options aren't limited to expensive restaurants, but can also be ordered and eaten right off the street. “The world's best street food culture comes from Asia,” says K. F. Seetoh, Singaporean street food expert and organizer of the annual World Street Food Congress. “It's such a great street food culture because we're actually selling heritage food. It's a form of cultural export." Seetoh likes to remind traveling eaters that street food has roots in both culture and commerce. “It's something my grandfather cooked at home [learned] from his great grandfather, and we had no choice but to sell it on the street,” he said, comparing these heritage recipes to “ATM cards” that street food hawkers guard with their life. The cities in this list represent the best street food experiences you can put on your itinerary. Our choices reflect high performance in three criteria: authenticity in presentation; low prices, and high reputations for sanitation. All told, the street food experiences in these cities reward adventurous eaters with culinary experiences that are in equal measures plentiful, spicy, and completely out of this world. The street food scene in the Malaysian city of George Town, Penang is rooted in its long history as a magnet for immigrants. Centuries of Peranakan, immigrant Chinese, European, and Indian (both Muslim and Hindu) arrivals have made the Penang food scene an amazing mélange of flavors and influences, creating the first fusion food scene in Asia, long before there was even a name for it. Visitors to Penang should allot plenty of time to explore each sphere of culinary influence, one by one. Malaysian Indian culture contributes to the street food scene in the form of nasi kandar, white rice and halal meat drowned in curries; and mee goreng prepared "Mamak" style, combining Chinese-origin fried noodles with Indian spices. The indigenous Malay culture makes its presence felt via Malaysia's national dish, nasi lemak: rice steamed in coconut milk, then served on a banana leaf with deep-fried anchovies (ikan bilis), sliced-up hard-boiled egg, sliced cucumber, peanuts, and the spicy sauce known as sambal. And the Chinese of Penang produce noodle-based street food favorites like char kway teow, flat rice noodles stir-fried over a high heat in a wok with soy sauce, spring onion, bean sprouts, prawns, cockles, and Chinese sausages; and Penang laksa, made up of thin rice vermicelli noodles drowned in a mackerel-infused broth seasoned with lemongrass, chili, and tamarind. All these delights are available right on the street for anyone to enjoy. Visitors can walk up and down George Town's Lebuh Chulia after dark (among other places) to sample an almost endless assortment of Malaysian must-try street foods. Having a centuries-old monarchy is good for more than just interesting royal homes to visit; a long, unbroken tradition of royal cuisine has gifted Bangkok, Thailand with an amazing culinary spread that is unmistakable in its local origins. The magic of Thai food filters down even to its humble street food, apparent in the glorious flavor of local cheap eats like pad thai, green curries, and tom yum. Eating street food Bangkok is both literally and figuratively miles distant from the Thai food you're used to eating back home. Benefiting from the use of original spices and techniques, these Thai favorites taste much better than any similar foods you'll find Stateside. You'll also find Thai traditional food that only rarely get exposure outside Asia, like the Isan-style minced meat and sticky rice known as laap; the Chinese-inspired fish porridge called Khao Tom Pla; and phat kaphrao, or fried meat infused with basil and served alongside rice. To get your fill of these dishes, you'll need to head to the city's most reputable foodie streets: Sukhumvit Road; Yaowarat Road in Chinatown; the Victory Point street market near the Victory Monument; and Lumphini Park's Ratchadmri Road. Reports of their demise have been greatly exaggerated. That means Bangkok street food gets to strut its stuff for a little while longer. 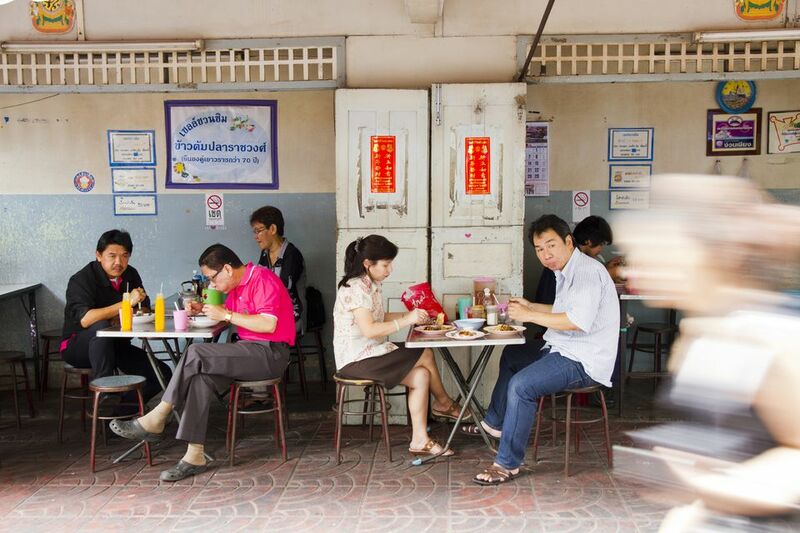 The discussion can get pretty heated when talk turns to Hanoi, Vietnam's street food scene. Hanoi locals, understandably, believe their Northern Vietnamese dishes to be the absolute paragon of Vietnam cuisine – a certain rivalry exists between Hanoians and their counterparts in Saigon, who possess a similar (but not identical) menu of delicacies. This obsession with perfection is all to your benefit, of course; you get top-quality nosh at streetside stalls in the Old Quarter. Venture deep into the Old Quarter's narrow streets and experiment with Hanoi-style pho noodles; cha ca la vong (a turmeric-infused fish dish and the namesake of the Old Quarter's Cha Ca Street); bun cha (fish with rice vermicelli noodles), and trung vit lon (fertilized duck egg; known in the Philippines as balut). For the lowdown on these dishes, read our summary of must-try dishes in Hanoi, Vietnam. Singapore is hardly the first country you'd think about when someone brings up street food. Actually, Singapore's government herded its formerly ambulatory street food vendors into the hawker centers that now stand on almost every corner in the country. Eat at one of Singapore's top hawker centers, and you're actually eating historic street food: just cleaned up and made more Instagram-friendly. Singapore's hawker food adapts dishes from every culture that calls Singapore home, reflecting influences from ancient culinary traditions – along with modern twists necessitated by convenience and contemporary tastes. Thus you'll find original Singaporean inventions like satay bee hoon (rice noodles drowned in peanut sauce; pictured above) competing for your patronage with Hainanese chicken rice (a Chinese mainland favorite adopted by Singaporeans). There are about 120-odd government-run hawker centers alongside at least over 200-plus privately run ones – you'll never be far from a street food experience wherever you may be in Singapore. All Indonesia’s roads eventually lead to the “Big Durian”, Jakarta – a massive megalopolis where the cliche “melting pot” only begins to describe the multiple cuisines that you can find in its restaurants and street stalls. There is no one “Indonesian food” - some dishes come from ancient indigenous cultures like the Javanese, Balinese and the Minangkabau (the latter the source of the ubiquitous Padang restaurants); foreign influences like Chinese and Dutch have become inextricably entwined with Indonesian food as well. Whatever culinary tradition you wish to follow up on, you’ll find it in full force on the streets. Indonesia’s essential street food menu range from bakso (meatball soup) to murtabak (pancakes with sweet filling) to kerak telor (sticky rice omelet mostly found in Jakarta). And it’s not all halal on the streets – Pekalongan, the street food district immediately outside the Alila Jakarta, sells pork satay hawked by Chinese vendors. Another memorable street food place can be found close to the Jalan Surabaya antique market – the Menteng district serves up an overloaded fried rice known as nasi gila - “crazy” fried rice with insane amounts of sausages, egg and spices! Visiting the World Street Food Congress? Grab These Five Dishes First! Will Singapore Street Food Thrive in This Upcoming Foodie City?